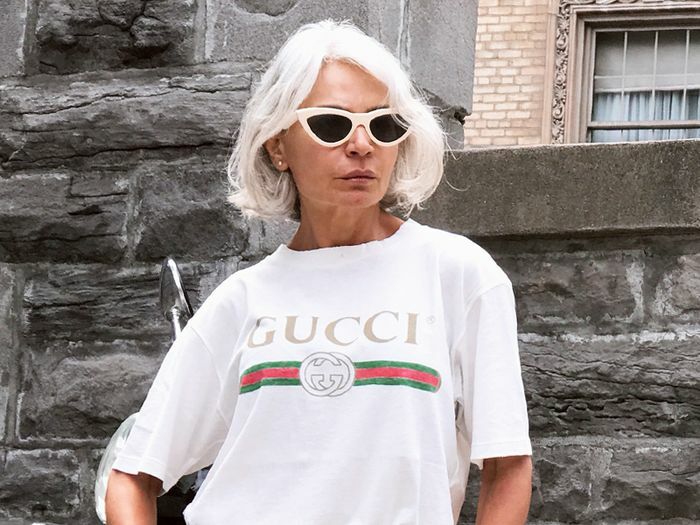 Last month, we met the fabulous 52-year-old fashion blogger Renia Jazdzyk, aka Vens Wife Style, to chat about personal style, shopping and ageism in the fashion industry. We gazed longingly at her array of enviable outfits, made mental notes of her favourite brands and lapped up all her sage soundbites. Not satisfied by a mere glimpse into the world of this Newcastle-based blogger, we decided to go for round two to get Renia's top tips on how to perfect personal style at any age. Whether it's her wardrobe essentials or creative approach to layering, this is the ultimate How to Dress 101. Scroll down to get her insider know-how. "By combining clothes from high-street stores with something designer, you can create a more unique look. The key is to mix and match: You can wear a Balenciaga bag with a Topshop dress and look like you've walked straight off the runway. Also, high-street clothes can be made to look more expensive simply by adding original accessories—whether it's unusual shoes or a beautiful bag. I find that every outfit can be spiced up with a unique accessory." "I recently rediscovered my love of vintage, and I can spend hours looking for vintage bags and shoes. You can find lots of amazing items on websites such as Vestiaire Collective, and most importantly, you don't have to spend a lot of money to get your hands on an investment piece, such as a Dior or Fendi bag." "Colours and prints can give you and your wardrobe an energy boost—even a single colourful element can change your whole outfit. I like a bit of pink or yellow, especially during summer. I'm very excited about the fact that animal prints are coming back and that they're one of the major trends for both the summer and fall. Don't be afraid to 'go wild' and look for something with a tiger or leopard print and mix and match them." "Layers, layers and layers. One of the things that I've learnt after coming to the UK is how to layer my clothes, necklaces or even rings. I love mixing prints and colours and creating something one of a kind in the process. This is such a great (and practical) trend for countries like England where we don't have beautiful weather all the time!" "I believe that everyone should own certain essentials such as perfectly fitted jeans, a high-quality (and a bit oversized) white shirt, a good check blazer, a beautiful trench coat and a leather pencil skirt. This summer, I'm all about midi dresses from Ganni, Réalisation, Musier Paris. Also, I love basket bags. Those are definitely my essentials."